Hockey is a great sport for kids. It teaches essential life skils like hard work, focus, and team work. To introduce kids to skating and hockey, we have our IP (instructional play) Program. Griffin Arena also has a learn to skate program (Early September) as well. These programs are for younger or in-experienced players who are new to the sport of hockey or for those who wish to participate in the sport on a developmental level. The programs are designed to teach boys and girls the fundamentals of ice hockey. The most basic skill to be successful in hockey is to be able to skate. To play competitive hockey, players need to be able to skate forward and backward, perform a "hockey stop" facing both directions, cross over to make a turn, and be able to get up quickly when they fall down. Griffen Arena teaches these skills in their Learn-To-Skate. Petoskey Area Hockey Association also teaches these skills in its IP and House programs. Winter-Sports Park also runs a Learn to skate and its also a great way to get started. Equipment - What To Look For? Helmet: Comfort is the key! A helmet should fit snug, have an adequate protective foam lining and a properly adjusted chin strap that gently "cradles" the chin when fastened. Full Shield or Visor Mask? Although the Visor offers better fields of vision, they can fog up from moisture. Defoggers are available for this. A Screen face mask provides much better ventilation but only adequate vision. Mouth guard: Very important in not only injuries to the mouth and teeth, but to the jaw as well. Because of their importance, be sure to follow the package instructions for proper fitting and changed frequently when they become "thin" or broken. Many brands now come with a small insurance-type guarantee on the back if there is an injury while wearing the guard. Look for those and keep your receipts to show proof of purchase. Stick: Wood or Graphite? Individual choice is the key, but wood is heavier, least expensive and breaks easier. Graphite (composite) shafts vary in shape and weight. They are the most expensive. To measure proper length, stand without your skates with the stick straight in between. Mark the stick where it touches your nose and this is where a professional should cut the shaft. To double check, put on your skates and hold the stick in the same position. The mark should now come to your chin or below instead of your nose. Why should we try ice hockey? 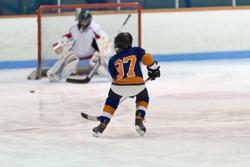 Hockey is high speed excitement on the ice and children learn to think & react quickly. It is one of the fastest games on earth where the nature of the game is that everyone gets to play! Often in youth sports, there is a starting 5, 9 or 11, but in hockey the shifts rotate!! Given that the season is September - March as well as a spring season, there is a great deal of bonding with teammates and families. Hockey is fun and safe!! Most people who are considering ice hockey have watched professional hockey where there is fighting, major injuries and no face masks. In youth hockey, you will find that they player is covered from head to toe and the face is protected by a mask. Checking is not allowed until age 11. The idea of a check is taught as a skill to gain control of the puck. Rules for poor conduct are in place an enforced by officials and the youth organization. Experienced volunteers will be coaching your child. Our coaches teach teamwork, self-discipline, sportsmanship, integrity and self-confidence, through hockey instruction, competition and play. This program is more competitive than the House Level for boys and girls ages 4 to 14.